Houston County will host special events for visitors from across the state and beyond for two weeks, leading up to the big birthday bash which will take place on June 12. The American Veterans Traveling Tribute (AVTT) will be bringing an 80 percent scaled replica, the largest replica, of the Vietnam Veterans Memorial in Washington,D.C. 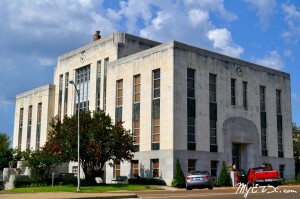 to Crockett, the county seat of Houston County, on May 30. The Traveling Vietnam Wall stretches over 360 feet long from end to end and contains all 58,253 names. The “wall” is current through 2009 and is constantly being updated by the AVTT to accurately pay tribute to those who died during the Vietnam War. The Traveling Vietnam Wall will be open to the public beginning at 12:00 p.m. on May 31 until 3:00 p.m. on June 3. The Cost of Freedom Tribute that will accompany the Traveling Vietnam Wall features displays representing statistics from every war/conflict in which the USA has been involved. Along with a series of World War II panels portraying the entire timeline of events, the Cost of Freedom Tribute, includes a Korean War tribute representing the timeline of the entire conflict with corresponding battle maps and photos. Visitors will also have the opportunity to view a timeline and a display of art from Vietnam veteran artists depicting patriotic and veteran themes. There also will be a display about the founding of the United States of America and significant historical documents including the Constitution, the Declaration of Independence and other historical documents. Houston County veterans are planning grand events to honor veterans of all ages each night the Cost of Freedom Tribute is in Crockett. Opening ceremonies will include the lighting of an eternal flame, which will be extinguished in a closing ceremony on June 3, accompanied by the playing of Taps. Take a self guided tour of Houston County’s historic sites. The Houston County Historical Commission will have maps available at the Houston County Visitors Center on West Goliad Ave. in Crockett, and at other locations throughout the county. Visit the historic Glenwood Cemetery in Crockett where many of the county’s founders are buried, Brewer Springs where Davy Crockett once slept, the site of the Edens-Madden Massacre, Mission Tejas State Park and many , many more. Houston County is home to nearly 300 historical markers. Visitors can purchase the Houston County Historical Commission’s new book that tells where 261 of these markers are located. The Crockett Area Chamber of Commerce will host the 76th Annual Fiddler’s Festival and Steak Cook-Off on Saturday, June 9. The Antique Tractor Show will be held in conjunction with the Fiddler’s Festival, and this year there will also be a Classic Car Show. A parade around the Courthouse Square in Crockett will feature both the antique tractors and classic cars Saturday morning. June 10,will mark Houston County Day at area churches. Several area churches have their own rich histories dating back more than a century. On June 11, descendants of the signers of the petition to create Houston County will be treated to a Founder’s Dinner. Also that night, there will be a re-enactment of that historic signing. J. Bryan Lake, executive director of the Pineywoods Fine Arts Association, will be directing the two-hour program. Finally, on June 12, at 12 noon, a silhouette of the late Eliza Bishop will be unveiled by artist Michael Brenner at Brewer Park in Crockett. Bishop is credited with writing volumes of Houston County history, and identifying Houston County as “Where Texas Began.” At 6 p.m. an official birthday ceremony will begin with proclamations and politicians addressing the public on the Square in Crockett. The first 2,500 people will get a free birthday cupcake. Celebrate history in the oldest county in Texas this year! For more information call Lynda Jones at (936) 544-2238. For veterans information, contact Houston County Veterans Service Officer, Fred Newtz, at (936) 544-3255, ext. 315. Demonstration at Porth Ag Arena by the Special Ceremonial Unit, 1st Cavalry Division, Horse Cavalry Detachment from Fort Hood. The Horse Soldiers use the original 1874 Drill and Tactics Manual as their guide for this performance. Designated by the Department of the Army as a Special Ceremonial Unit, the Horse Cavalry Detachment is the largest active duty Mounted Cavalry Unit in the United States Army. The detachment represents the 1880’s Cavalry “Horse Soldier” during the Indian Wars Period. The demonstration will include drill conducted at the walk, trot and gallop, while the weapons portion tests the skills required of the historic cavalry troopers. The detachment also has an M1878 supply wagon pulled by a two- or four-hitch mule team as part of the performance, and an original M1841 replica Light Mountain Howitzer cannon. The troopers’ uniform consists of a black cavalry hat, neckerchief, dark blue cavalry shirt with appropriate rank and specialty trade insignia on the sleeve, light sky-blue pants with yellow suspenders, black 19-inch boots with spurs, a prairie belt or campaign with black leather holster and gauntlets to protect their hands. The weapons used by the detachment include an M1860 Light Cavalry Saber, a modification of the earlier model commonly known as “the old wrist breaker,” a M1873 Springfield Carbine which was a trooper’s first choice of weapon because of its long range firing capability, and the M1873 Colt .45 caliber single-action revolver, the troopers’ most reliable and favorite weapon because of its continuous six-shot capability. The unit’s mission is three-fold: (1) to represent the 1st Cavalry Division and the U.S. Army in public appearances throughout the country, (2) assist in recruiting by demonstrating the professionalism of today’s soldier and (3) maintain the proud traditions forged by the cavalry in our country’s colorful history. The Horse Cavalry Detachment is an all-volunteer unit. With the exception of the civilian trainer and blacksmith, all personnel are active duty Army soldiers. They first must be released by their unit and then pass an established test before becoming a member of the elite team. Since its inception in 1972, the detachment has appeared in the 1984 World’s Fair, the 1981, 1985, 2001 and 2005 Presidential Inaugural Parades; several Tournament of Roses Parades in Pasadena, CA; and hundreds of state and local fairs, parades and rodeos. Admission is FREE. American Legion Post 134 is sponsoring the detachment’s appearance.